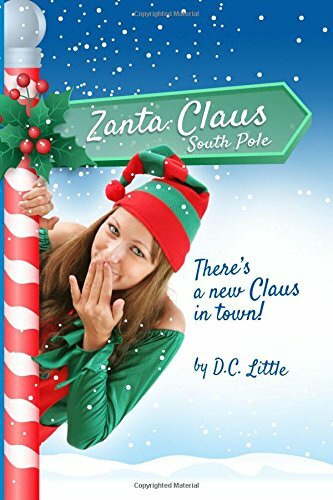 Zanta Claus is the perfect story to read to start off your Christmas Holiday. David Kringle is Santa's brother. He is a successful writer who has Santa's support one hundred percent. Unfortunately not everyone loves what he writes. His latest best seller has put some of the elves in a bad light. Martin has been named in several of his books. When it is time for his family meal with his brother and family, he learns just how upset Martin is with him. To say the ride was frightful is an understatement. But, David isn't going to let this ruin the surprise he has for his brother. He has finally figured out what he wants to do with his life and he sees it as a compliment to his brothers life. David wants to become the Zanta Claus. As Zanta Claus he will reach out to all of those children and adults who no longer believe in Santa. He gets his brother's support and takes it before the Fairy Tale council where he is granted a one year trial. He has one year to set everything up and make it work before he meets back with the council. I loved that everything was the opposite so as not to take away from Santa. David's outfit was black with red fur and his shop was setup in the South Pole. They didn't make traditional toys, they went more with what would get the attention of those who no longer believed in Santa. Will he succeed? You will have to read it to find out. This was a super funny book. I kept picturing Tim Allen and Will Ferrell as I read. I could see this as a great Christmas movie. I loved that the author gave Zanta his start with what appeared to be a mismatched group of elves and reindeer. Like all "Hallmark" type Christmas story, there was even a love story to go with it. It is so fun to read that I found I was finished before I knew it. I definitely will reread this each year because in my book it is just that good. I am so glad I was asked to read and review this book. D.C.'s passion for life has always burned bright. His writing is directly focused on providng readers a break from the realities of life through moments of laughter and joy.